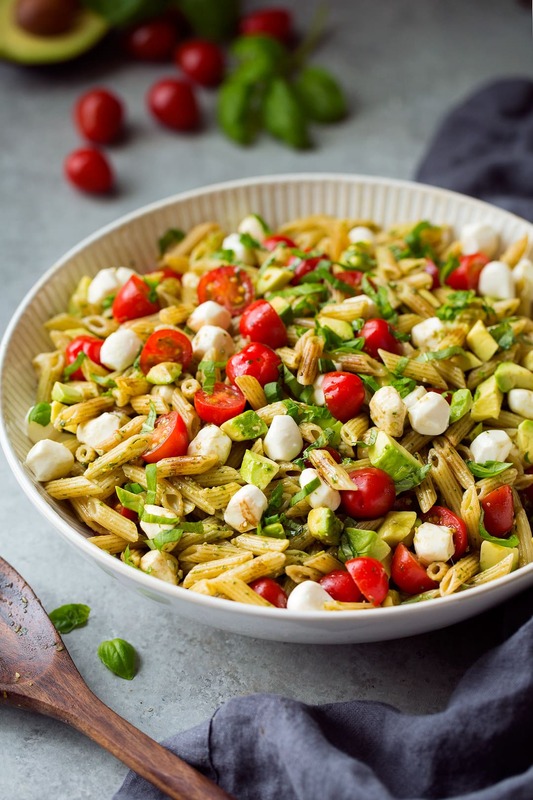 Avocado Caprese Pasta Salad will be one of the tastiest pasta salads you’ve tried! It’s packed with mini pasta, fresh mozzarella pears, fresh tomatoes, fresh basil, fresh avocados and a tasty balsamic glaze. In other words lots of fresh exciting flavors here! 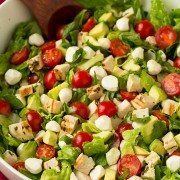 You can never have to many pasta salad recipes! 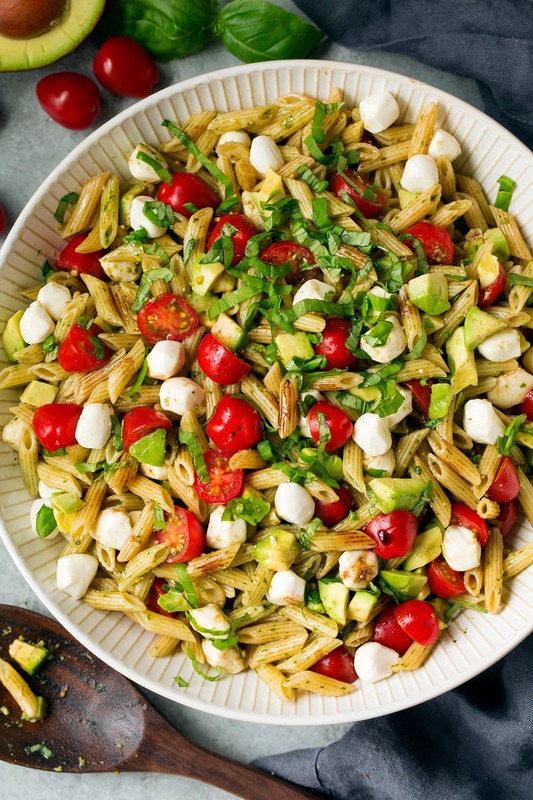 Especially when they are as good as this Avocado Caprese Pasta Salad! 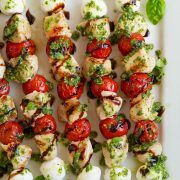 The classic Caprese combo – tomato, basil, fresh mozzarella + balsamic vinegar is one of my favorite summer flavor blends. All those fresh flavors together paired with that tangy slightly sweet balsamic vinegar or glaze just makes my heart sing. And so I decided why not mix those flavors into a pasta salad, and why not add avocado? Because when you add avocado to the Caprese combination things just get that much better! Make pesto in a food processor. In a bowl toss cooked pasta, tomatoes and pesto together. Add avocados, mozzarella, and balsamic vinegar and toss lightly. Can I Use Store-Bought Pesto? If you’d prefer not to make a homemade pesto (the 1 cup basil, parmesan, pine nuts and olive oil mixture) you can use a store-bought pesto (it just won’t be quite as good and the coloring is kind of blah to me). I would probably go with 1/4 cup plus a few tablespoons of olive oil (then don’t leave out the basil ribbons). And I know I find myself saying this way too often but what better to serve this with than grilled chicken?? A perfect summer meal! This will be one of the tastiest pasta salads you've tried! It's packed with mini pasta, fresh mozzarella pears, fresh tomatoes, fresh basil, fresh avocados and a tasty balsamic glaze. In other words lots of fresh exciting flavors here! Cook pasta in boiling salted water according to directions on package. Drain and let cool completely. In a food processor pulse 1 cup basil leaves, parmesan, pine nuts, and garlic until minced. Pour in olive oil and process until everything is finely minced. Season with salt and pepper to taste. 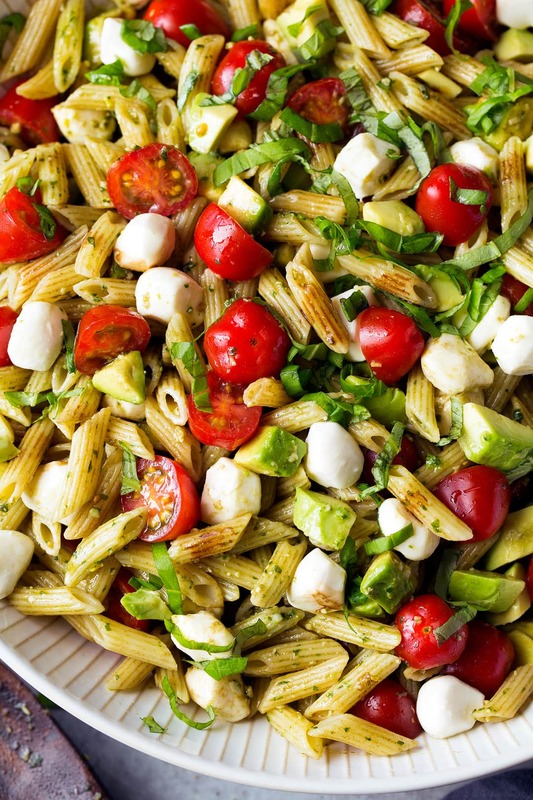 Add pasta and tomatoes to a salad bowl. Pour basil (pesto) mixture over pasta and tomatoes and toss to evenly coat. 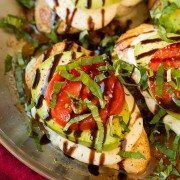 Add in avocados, mozzarella, basil (set some aside to garnish over top if desired), and pour in balsamic vinegar and toss just lightly. Serve immediately with more balsamic vinegar and parmesan if desired.